Discussion in 'Pin Zaps & Swaps' started by swscref, Sep 5, 2018. 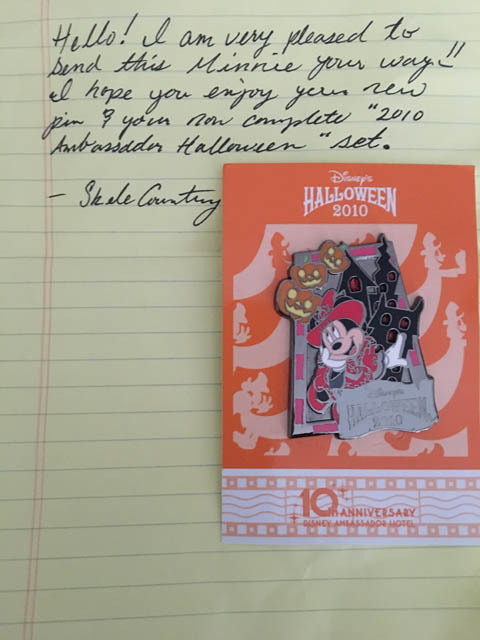 Knowing that I had been searching for this pin for years without much luck, SkeleCountry was kind enough to throw it my way when she found an extra one. I can't thank you enough for helping me to finally complete the Ambassador Hotel Halloween Collection from 2010.
pretty Omi, Papaya, PixiePost and 4 others like this. That’s awesome! Let’s see the whole set now!! Yes! Please post a pic in the complete sets photo thread, would love to see it. Congrats! Congrats on completing the set! That is so nice of @SkeleCountry Congrats for finishing the set! And amazing feeling! Super cute pin - Congratulations! Congratulations! Love this pin, the design and embellishments are really pretty.